This pesto is fast, super easy to make and bursting with fresh herb flavor. 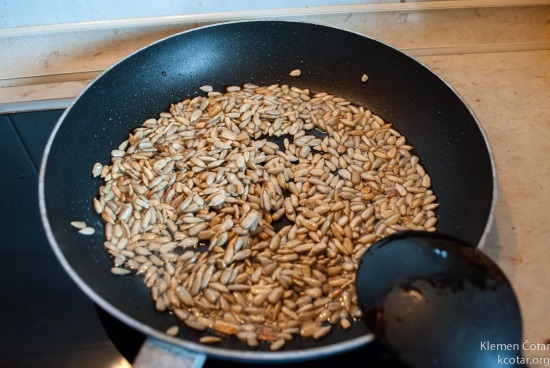 First roast the nuts to make them crunchier and bring out their taste and flavor. Combine the wild garlic, garlic cloves and fresh wild garlic leaves in food processor and pulse until coarsely chopped. Add the olive oil, freshly grated Parmesan and process until the mixture is fully incorporated and smooth. Season to taste with salt and pepper. 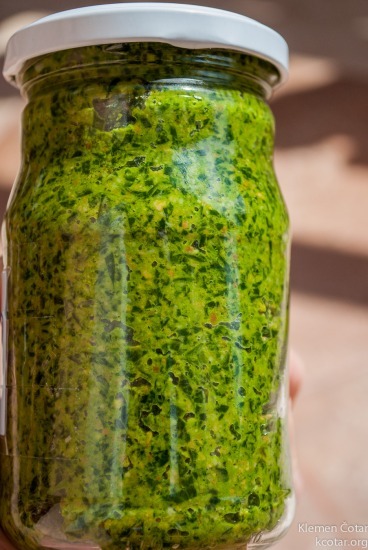 Pesto can be used immediately or transferred in airtight glass jar and stored in refrigerator for up to few months. Finished product in glass jar. 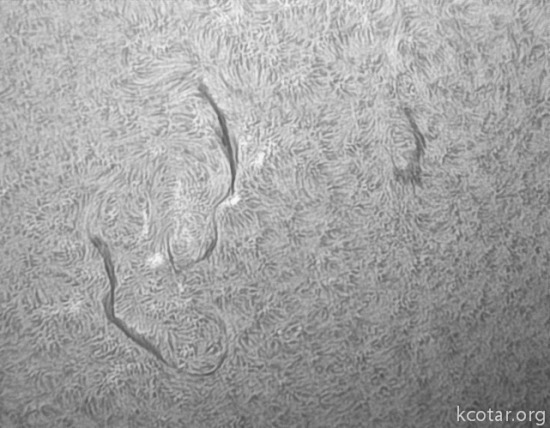 Some of the filaments visible on the surface of the Sun on this day. 02 – Uranus will pass through superior conjunction with the Sun. 09 – Mars reaches opposition for 2014, shining at magnitude -1.5. 12 – A close conjunction of Venus and Neptune occurs, with the planets just 0.7 degrees apart at 2h UT. 12 – Asteroid (1585) Union occults a +9.3 magnitude star at 23:44 UT – more details. 13 – Asteroid 4 Vesta reaches opposition, shining at magnitude +5.8. 14 – A close conjunction of Mercury and Uranus occurs, not visible because of their proximity to the Sun. 15 – Full Moon at 07:42 UT. 15 – Asteroid 1 Ceres reaches opposition, shining at magnitude +7.0. 18 – Asteroid (26146) 1994 PF27 occults a +6.5 magnitude star at 19:41 UT – more details (very low probability). 22 – Lyrid meteor shower peaks at 18h UT, ZHR predictions for this year are very poor. 23 – π-Puppids meteor shower peaks at 23h UT, ZHR predictions up to around 40. 26 – Mercury will pass through superior conjunction with the Sun. 29 – New Moon at 06:14 UT.